Use TB2QA9J to reference this item. THE COIN WAS STOLEN FROM A CACHE! PLEASE, IF YOU SEE IT CONTACT WITH THE OWNER AND RETURN IT TO THE GAME!!! This coin’s mission is to raise bike awareness; riding safely takes everyone’s cooperation and patience. It's a painful fact of life that motorcycle riders are 30 times more likely to be killed in a crash than any other vehicle drivers. Please help the coin to spread its message, and in the end of 2010 to come to Greece, in Rhodes island and specific at the cache named "Rodini" (GC12VJQ). On August 12, 2008, Tod was riding a motorcycle when he was killed in an accident caused by a left turning vehicle. Tod was the third member of Team Rod & Tod w/KAboom. This coin is released in his memory and in memory of all motorcyclists killed on the road. Speeding, inattention, fatigue, drugs and alcohol and illegal manoeuvres are given reasons for causing accidents. YOU have the power to do something to control each of these factors. Some of the catch phrases that have been used to promote safe driving and riding: Rolling stops kill, driving and riding responsible helps save lives! Respect those around you, watch for all users of the road! Stop driving distracted, look for bikes! Bikes have every right a car does, please share the road! 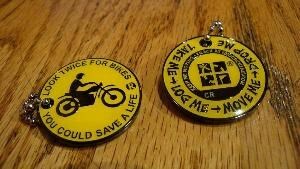 Come and join us at “Todies Wild Ride” in the geocoin discussions, read, write and learn "watching for bike safety". This geocoin was not seen in cache Eketorp Fort according to log March 13 by cache owner Team Jatsy: Kontrollerade och städade ur burken från skräp. Inget av de spårbara objekten som skulle finnas där var kvar?????. = Checked and cleaned up some rubbish in the box. Noone of the trackables listed in the cache was there????? Sorry for bringing bad news, let us hope your coin shows up later. Going to get my license this summer, nice idea for a nice coin! In this cache the coin is in a good position for bike viewing. Only problem is that the winter still holds a grip on northern Sweden. This nice coin is coming with me to Umeå. A real bike town!